Germany’s state consumer protection ministers are calling for an EU-wide ban on the leading global pesticide Glyphosate, after it was categorised as carcinogenic by the WHO. However, the federal government sees no need for action. EURACTIV Germany reports. After reevaluating the most widely used pesticide in Germany and worldwide, the World Health Organization’s (WHO) cancer researchers have categorised Glyphosate as “probably carcinogenic to humans”. In a resolution on Friday (8 May), Germany’s state ministers called for “the supply to and use by private persons to be banned for precautionary reasons”. In addition, the politicians argue that Glyphosate should be prohibited for uses close to consumers. “This pesticide should not be found in gardens, parks or on children’s playgrounds. I also do not think use in private gardens is appropriate,” explained Lower Saxony’s Consumer Protection Minister Christian Meyer. He is the current chairman of the Consumer Protection Minister Conference. Glyphosate is the most commonly used pesticide worldwide. It is used in agriculture, particularly in fruit and grain cultivation, but also in small garden plots. The agricultural giant Monsanto distributes Glyphosate under the product name “Round-Up”. The market share of this herbicide could continue to grow in the future if the cultivation of genetically modified plants is approved in some EU member states. Most genetically-modified plants like corn are designed to be resistant to Glyphosate. In this way, herbicides can be administered to fields, eradicating weeds and other plants without harming crops. The state minister’s resolution comes at a critical time: the EU’s approval for Glyphosate will expire at the end of 2015. The European Commission is currently conducting a new approval procedure, including a risk analysis. Germany is a leading member state in this process. Still, at an expert hearing last summer, the Federal Institute for Risk Analysis (BfR) certified the herbicide as exhibiting relatively low toxicity. The federal government’s representative, State Secretary in the Agriculture Ministry Robert Kloos, deflated hopes that a ban could come soon. “At the moment, we are missing the legal basis needed for a ban,” he said, for the time being we must wait on the EU’s approval procedure. Meanwhile, the BfR sees the WHO paper as “difficult to comprehend scientifically on the basis of the existing information and apparently only backed up by a few studies”. For the present, there is no reason to change its appraisal that the widely-used herbicide Glyphosate is not carcinogenic, the BfR responded. WHO researchers assessed the substance’s cancer risk by means of three epidemiological studies from the United States, Canada and Sweden. However, they failed to consider a large number of other studies that clearly failed to show an increased risk of cancer. “The fact that various bodies evaluate things differently based on varying information and assessments of experimental data, is a common occurrence in risk analysis,” the BfR indicated. For this reason, the WHO study will be thoroughly checked, they said. State Agriculture Minister Meyer said he sees it as the politicians’ duty to protect people’s health. 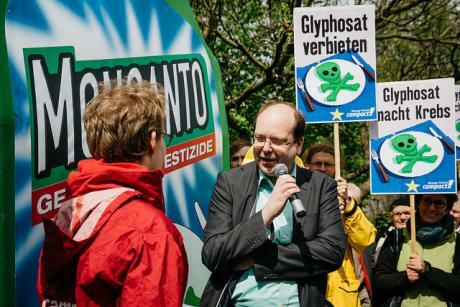 His colleague in the Bundestag’s Green Party faction, Harald Ebner, called the WHO’s re-evaluation of Glyphosate alarming and called for prompt consequences. A public protest on the issue came just ahead of the state ministers’ decision. On Thursday (7 May) around 80 environmentalists demonstrated against the use of Glyphosate. They presented Agriculture Minister Meyer with over 200,000 signatures collected in support of an immediate ban on commercial and private use. Amid growing public concern over the impact of pesticides, the European Commission in 2006 presented a 'pesticides package' aimed at protecting human health and the environment from their dangerous or excessive use in agriculture. Agreement on the package was reached in December 2008. The new regulations divide the EU into three zones (north, centre, south) inside of which mutual recognition of pesticides will become the rule. Certain highly toxic chemicals, namely those which are genotoxic, carcinogenic or toxic to reproduction (unless their effect would in practice be negligible) including neurotoxic, immunotoxic and certain endocrine-disrupting substances, if deemed to pose a significant risk. Bans aerial crop spraying, with exceptions subject to approval by member-state authorities. Asks member states to establish approporiate measures, such as buffer zones, to protect aquatic organisms. Bans the use of pesticides in public places, such as parks and school grounds, or at the very minimum asks for their use to be restricted. The European Parliament voted to seal the agreement in January 2009.